Slobodan Milošević represented the last gasp of a discredited type of politics, but he was also the harbinger of a new one – not just in the former Communist East, but also in the West. His policies ensured that Communist dictatorship would not go peacefully to its grave in Yugoslavia, as it had in most of Eastern Europe, but would instead create a spectacular conflagration, claiming the lives of tens of thousands of innocent victims before burning itself out in total defeat. Yet despite this record, or perhaps in some sense because of it, Milošević’s cause became the cause of all those across Europe and the world – conservatives of the left and conservatives of the right – for whom the idea of progress under liberal capitalism was and remains anathema. Milošević deliberately promoted the break-up of Yugoslavia and the independence of Croatia and Slovenia; he championed free-market reforms; he struggled to build good relations with the West, even supporting the US in the 1991 Gulf conflict; he waged wars against sovereign independent states without a mandate from the UN Security Council; and he initially endorsed the activities of the International Criminal Tribunal for the former Yugoslavia (ICTY). The Western alliance was very slow to confront him, treating him more as a partner and collaborator than as an enemy, right up until the late 1990s. As an anti-imperialist, Milošević was no more successful, and was considerably less sincere, than he was as a Great Serbian nationalist. Yet it is not the real historical figure, rather the myth of Milošević, that has made him a hero to so many of those opposed to the ‘new world order’: he was the conservative’s Communist; the Communist’s champion of free-market reform; the peacenik’s warmonger; the UN-worshipper’s defier of international law. In sum, a paradoxical poster-boy for an anti-modern coalition comprised of opposites. The real Milošević – as opposed to the myth created by his Western admirers – cannot be understood without reference to the long-term Serbian and Yugoslav historical context. Milošević was the leader of a secessionist Serbian rebellion against a Titoist Yugoslavia that had kept Serbia in check. Josip Broz Tito’s Communist-led Partisans, who fought against the Nazi occupiers of Yugoslavia, founded their federal Yugoslav state on the ruins of the Third Reich – but also on the ruins of Great Serbian nationalism. The Partisans were essentially a west-Yugoslav movement whose strongest wing was in Croatia: its leader, Tito, was a Croat, and the Communist Party of Croatia mobilised more Partisans than any other section of the Yugoslav Communist organisation. The most important source of Partisan manpower was the Serbs of Croatia and Bosnia – but they fought under the banners of a free Croatia and a free Bosnia within a Yugoslav union of equals, and against the goal of a Great Serbia that was being championed by the Partisans’ anti-Communist rivals – the royalist Chetniks. The latter’s bastion was in Serbia. It was only with massive Soviet assistance that the Partisans were able to conquer Serbia and defeat the Chetniks, and in doing so, the Partisans cut Serbia down to size: countries considered by many Serbs to be ‘Serb lands’ - Bosnia, Macedonia and Montenegro - were established as republics in their own right, while Vojvodina and Kosovo were made autonomous entities within Serbia. From the 1960s, Tito’s regime moved Yugoslavia further from the centralist constitutional model that Serb politicians had traditionally favoured, toward a semi-confederacy in which not just the republics, but the autonomous provinces of Vojvodina and Kosovo, increasingly behaved like sovereign entities outside the control of Belgrade. It was this ‘anti-Serb’ constitutional order that Milošević set out to destroy. Milošević was a creature of the Titoist Communist system who rebelled against the system. He pursued an independent Serbian political line that was at variance with the wishes of other Yugoslavs, tearing apart the fragile Titoist system that depended upon consensus and compromise for its functioning; he undermined and destroyed federal institutions; and from mid-1990 he pursued the policy of expelling Croatia and Slovenia from Yugoslavia. The new Serbian constitution promulgated by Milošević in 1990s declared the ‘independence’ of Serbia and its right to pursue its own international relations; in March 1991, Milošević effectively seceded from Yugoslavia, declaring Serbia would no longer respect the authority of the Yugoslav Presidency; in May 1991, Milošević decapitated Yugoslavia, by blocking the election of Croatia’s Stipe Mesic as Yugoslav president, thereby leaving the country without a functioning executive. Yet all this was done in the name of defending ‘Yugoslavia’. In attempting to carve out new Serbian borders, Milošević attempted to merge Titoism with Great Serbian nationalism, by establishing a ‘new Yugoslavia’ that would be composed entirely of Serb and Montenegrin entities as defined by Milošević’s ‘socialist’ ideologue Mihailo Marković in October 1991, this meant Serbia, Montenegro and an additional Serb unit made up of ‘Serb’ lands conquered from Croatia and Bosnia - Titoist and Yugoslav in form but Great Serbian in content. In seeking to reconcile these irreconcilables, Milošević fell between two stools, for the young people of Serbia were unwilling to fight and die for such confused goals, in a ‘Yugoslav’ army that was neither genuinely Yugoslav, nor pursuing real, open Serb-national goals. Wracked with desertion, the military forces of Serbia and the Yugoslav People’s Army were rescued from defeat in Croatia only by Western diplomacy – not for the last time, the ‘anti-imperialist’ side was saved by the ‘imperialists’. In Bosnia, Milošević’s Bosnian Serb satellites pursued an equally contradictory goal – seeking to conquer Bosnia and secede from it at the same time. 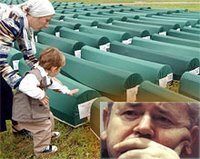 The Serb genocide of Bosnian Muslims and Croats provoked a powerful Bosnian resistance, while the dirty character of the war waged by the Serbs, and the confusion over their goals and their borders, again ensured a Serb defeat. Despite the readiness of John Major’s British Conservative government, François Mitterrand’s French Socialist regime and Bill Clinton’s vacillating Democratic administration, to collude in Milošević’s aggression and genocide, the world-wide revulsion caused by the latter eventually mobilised a powerful global counter-current uniting principled opinion from across the political spectrum. The Srebrenica massacre marked the turning point in Western policy, which gradually shifted. NATO attacked Bosnian Serb forces in 1995; Clinton then rescued the Bosnian Serbs from defeat at the hands of the Bosnians and Croatians, forcing the latter to abandon their victorious advance, and followed this up with the ambiguous Dayton Accord, which recognised the Bosnian Serb statelet created by genocide, but nevertheless buried forever the possibility of a Great Serbia. Milošević was Clinton’s ally at Dayton, even pledging Serb cooperation with the ICTY. But the tide had turned, and when Milošević attempted a third round of ethnic-cleansing, in Kosovo in the late 1990s, the Western alliance partially redeemed its earlier disgrace, and this time took resolute action to stop him. The movement in opposition to the Kosovo War in the West marked the scraping of the bottom of the ‘anti-imperialist’ barrel, with its selective opposition to war (it did not oppose Milošević’s), selective support for national sovereignty (it did not uphold Bosnia’s or Kosovo’s) and selective respect for UN resolutions (it did not support those directed against Milošević). This was a precursor to the equally unprincipled stance of part of the ‘anti-war’ movement over Iraq – involving support for Arab dictators, Iraqi Sunni sectarian murderers and Islamic fundamentalist fascists. Milošević – the phoney socialist, phoney anti-imperialist and phoney champion of national sovereignty – remains an appropriate hero to all those for whom opposition to ‘Bush and Blair’ is so absolute as to override all principles – such as democracy, anti-fascism, human rights, gender equality and national self-determination – that might once have been unquestionable for all politically honourable people. Milošević personifies the link between the Communist dictatorships of the twentieth century and the anti-American left of the twenty-first. The author is a senior research fellow at Kingston University. His How Bosnia Armed was published by Saqi in 2004, while Genocide and Resistance in Hitler’s Bosnia: the Partisans and the Chetniks will be published by OUP in September 2006.